Raya Airways Sdn Bhd, a renowned name in the cargo airline business in Asia. The airline, established in November 1993, has under its wings, more than 22 years's experience in cargo business. Raya Airways offers scheduled and express delivery, aircraft charters, ground handling, warehousing, trucking connections, and MRO (maintenance, repair and overhaul) services to its prestige line of clientele. Historically, Raya Airways Sdn Bhd is a restructured entity of the former Transmile Air Services Sdn Bhd (TAS), formerly a wholly-owned subsidiary of Transmile Group. Due to this exercise, Raya Airways inherited the good legacy of experience, knowledge, expertise and good track service record in the cargo industry. 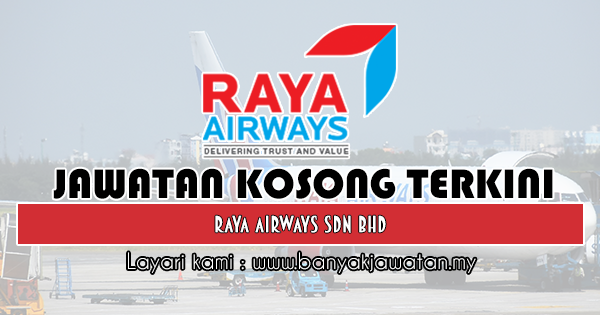 0 Response to "Jawatan Kosong di Raya Airways Sdn Bhd - 6 April 2019"